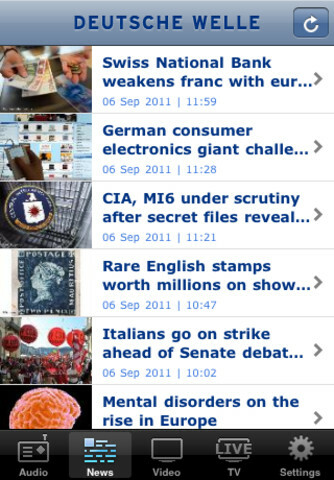 DW has now released a new version of the DW News Portal – it’s iPhone app. The new version makes it easier to share content via social media – allowing users to post articles and videos directly to Facebook and Twitter, or send them via e-mail. The DW News Portal offers live streams in German, English, Russian and several Asian languages as well as background information and current news from politics, business, science, German Bundesliga, culture and lifestyle. The App is also available for Android devices. Find out more about all of DW’s online and mobile services. Along with our version for the iPhone, the Deutsche Welle News Portal is now available for Android devices as well. It features articles from DW-WORLD.DE, the audio live stream from DW-RADIO and a video live stream from DW-TV and is available for free in 11 different languages. Download it from either the iTunes Store or the Android Market.